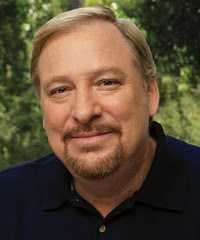 Rick Warren criticizes Baptist churches clinging to “tradition” that does not take into account modern culture; like the tradition of Bible preaching as defined in II Timothy 3:16, “doctrine, reproof, correction, instruction in righteousness.” Baptist Warrenites now use evangelical-style preaching that uplifts people without sweeping out the dirt from underneath their feet, preaching which professes righteousness without condemning sin, preaching, which “reaches the people where they are,”without guiding them by the hand to where they ought to be. Baptist people are forsaking the tradition of modest dress, as God commanded in I Timothy 2:9. Isaiah 47:3 teaches that it is a shame to be unclothed, and lack of clothing is associated in the Bible with bad music (Exodus 32:18-19, 25), drunkenness (Lamentations 4:21, Habakkuk 2:15), prostitution (Ezekiel 16:36, 23:18, Revelation 17:16). On the copyright page of his book THE PURPOSE DRIVEN CHURCH before you even arrive at the Table of Contents you will find something on the copyright page. On that page Pastor Warren lists seven different “bibles” he quotes within the pages of his book. These include the New International Version, then New Revised Standard Version, New Century Version, J. B. Phillips, and The Message. Interesting, Rick does quote several times from the King James Bible, but since it is not copyrighted, he did not have to receive any man’s permission to use it. Of course my question is how in the world did Rick Warren fool so many Baptists and especially our young ones? These declarations could easily have been made from a Baptist pulpit. By these statements, however, he does not mean the confrontational, on the streets, one-on-one soul winning demonstrated in the Gospels and the book of Acts. Instead, he teaches the drawing of the “unchurched” into a “seeker service” designed specifically to win souls. He accomplishes this not by door-to-door soul winning, but with advertising, surveys, seeking out what the people want, and community programs. He brings the “unchurched” in, then preaches the plan of salvation from the pulpit sandwiched in between a rock and roll show with Jesus name added. Warren teaches not to pressure a man to receive Christ (page 304), despite the great Apostle Paul’s example, who “disputed with” and “persuaded” men in Acts 19:8. At the invitation, rather than bringing sinners to the altar, he asks visitors to indicate on their visitor card whether (A) they believed in Christ that day, (B) they had previously “committed their life to Christ,” (C) they were still thinking about it, or (D) they doubted they would ever receive Christ. The use of a “seeker service” instead of one-on-one soul winning is man’s method, not God’s method. Even at the day of Pentecost, the thousands who heard the Gospel had not come to any service at all. Peter and the other Apostles took advantage of the crowds on the street during a Jewish feast day. They had not church building yet. In fact, in the book of Acts, there is not one record of anyone being saved or even baptized in a church building. Cornelius and his companions were baptized in Cornelius’ house in Acts chapter 10. Lydia and her household were baptized in a river in Acs 18:7-8. The book should be titled THE CULTURE DRIVEN CHURCH, for that is its central theme. The basic premise of the book is that the church should adapt itself to the culture of those whom they are attempting to reach with the Gospel. Yet, the Bible says, “come out from among them, and be ye separate…” (II Corinthians 6:17). Jesus was “separate from sinners.” (Hebrews 7:26). In fact, separation is not on the part of the saved, but the unsaved and unspiritual, who “separate themselves, sensual, having not the Spirit.” (Jude 19). There is a definite division in the New Testament between the lives of believers and unbelievers, the spiritual, and the carnal. Anyone can be saved, but the saved are commanded to be separate from their carnal culture. “I will set no wicked thing before mine eyes…” (Psalm 101:3) “Abstain from all appearance of evil…” (I Thessalonians 5:22) “Mine eye affecteth mine heart…” (Lamentations 3:51) “…he hearth cursing and bewrayeth it not.” (Proverbs 29:24) Did Pastor Warren stand up in the middle of a movie with cursing and denounce (bewray) the bad and vile language during a movie? I wouldn’t count on it! Pastor Warren is bringing sinners out of the world into an environment that is no different from the world. He is like King Ahaz in II Kings chapter 16, who saw an altar in a pagan temple in Damascus. He liked it so much, he had the priests in Jerusalem make one just like it. He then arranged the furniture of the temple around the Syrian altar. There his priests performed sacrifices. Go ahead, Baptist Warrenites, rearrange the furniture of the temple; it’s your children who will abandon the temple. It is your children who will worship idols. It is the men of God of the next generation who will have to evangelize your own children and grandchildren. Pastor Warren labels our churches as “traditionalists” unwilling to give up “man-made” traditions, clinging to a few “proof-texts,” and “isolationism” that is stuck in the “culture” of the 50’s. He then encourages our young men to mix and mingle with the world, and model the next generation’s churches after the “worldly lifestyles,” abandoning such ideas as confrontation soul winning, old fashioned church music, and modest dress standards, and especially hard-hitting preaching. Although they talk much about “life application,” their encouraging messages uplift the spirit without touching the soul. They minister to spiritual junkies looking for a quick fix. Because this generation cannot “endure sound doctrine” Rick Warren has become the teacher willing to tickle their ears. (II Timothy 4:3-5) Much like Billy Graham, Warren will impact this generation, but leave no godly heritage for the children and will ruin the orchard. Warren has given birth to the EMERGING CHURCH movement and it is nothing more than like the Jesus Freaks of the 60’s. Pardon me but give me a Dr. Jack Hyles, who produced a second generation and a third generation of Christians serving God. The real proof of a church is in succeeding generations. There is rarely a second-generation Warrenite. Their children develop a taste for the worldly lifestyle that their own pastors have taught them to live by. A church ought to be a haven from the world, not an extension of it. Baptists are being fooled by Warren’s conservative-sounding doctrine while being influenced by his worldly philosophy and lifestyles. We are to work at bringing man up to God and not bring God down to man in our churches. The local church must be a foretaste of Heaven not a foretaste of the world.